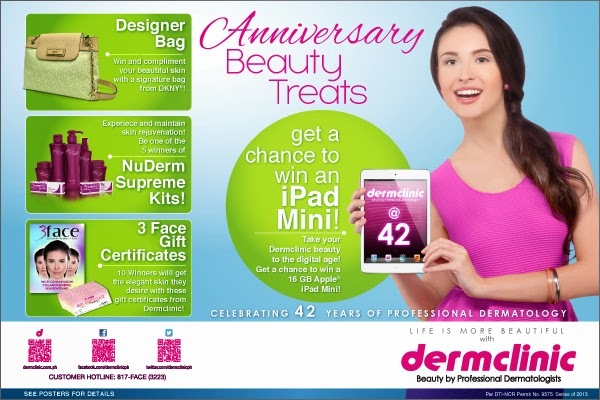 Dermclinic is celebrating its 42 years in the professional dermatology industry. Congratulations Dermclinic!! I also want to show you the fourth and final installment of the Dermclinic Giveaway. Just wait for the rafflecopter widget to load for the mechanics. Good luck. 1. Clients are entitled to one (1) raffle coupon for every Php 3,000 single receipt purchase of products and/or services. Ex: Php 10,000 worth of single receipt purchase = 3 raffle coupons. 2. Clients shall fill-out a raffle coupon with their Name, Address, phone number, and signature; and drop in drop boxes located in all Dermclinic branches nationwide. Submission of entry is from November 1, 2013 until November 30, 2013 only. Prizes are not convertible to cash. 3. Sealed drop boxes shall be collected one day after the deadline for dropping of entries and brought to Dermclinic head office in MGF Champaca Bldg., 156 Amorsolo St., Legaspi Village, Makati City for safe keeping under the custody of Ms. Evangeline V. Oasan. A DTI representative will be invited to be present in the opening of drop boxes and during the determination of winners. Draw date will be on December 3, 2013 at 11 a.m., on the 3rd Floor VBP Hall of Dermclinic head office. Winners will be drawn by the Dermclinic Sales and Marketing-OIC and the Dermclinic Operations Manager. 4. Winners will be notified through their mobile phones, e-mail and registered mail. Names of winners will be posted in all Dermclinic branches nationwide. 5. Winners must present two (2) valid ID’s and a notification letter from the Dermclinic Marketing Department. 6. For GMA area and Luzon area winners, redemption of prizes shall be made at the Dermclinic head office located at 5/F MGF Champaca Bldg., 156 Amorsolo St., Makati City. For Visayas area winners, prizes shall be redeeemed at the Dermclinic branch in SM Cebu. Redemption period shall be within 60 days from receipt of notification. Tax for prizes will be paid for by Dermclinic, Inc.
7. A participant can only win once. In case the name of a participant is drawn more than once, he/she gets the higher-valued prize. 8. Employees of the VBP Group of Companies are not qualified to join including their relatives up to second degree of consanguinity or affinity. OMG! <3 Praying and hoping to win! !